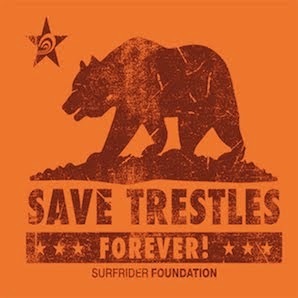 Save Trestles: We Did It!! The Coastal Commission rejected the Toll road! We Did It!! The Coastal Commission rejected the Toll road! Yesterday was a great day for the coast!! The California Coastal Commission voted 8-2 to reject the planned 241 Toll Road and to protect Trestles and San Onofre State Beach. Thousands turned out for this historic meeting in Del Mar, making it clear to the commissioners that the destruction of state parks and coastal resources is unacceptable. The record-breaking crowd was comprised of a diverse cross-section of beach users including surfers, students, families, seniors, fishermen as well as a large number of Native American tribal representatives. Also on hand was a massive contingent from the surf industry, including various manufacturers, shapers, media representatives and pro athletes. Many of you sent letters to the Commission and to the Governor asking that this road be blocked. Many of you told the Commission on YouTube to protect our state park and beach. And many of you showed up to the meeting prepared to demonstrate to the commission and the world that our parks and coasts are not to be destroyed. Of course Surfrider Foundation didn't do this alone. We want to thank our partners with the Sierra Club, CA State Parks Foundation, Natural Resources Defense Council, Endangered Habitats League, Sea and Sage Audubon Society, Defenders of Wildlife, WildCoast and countless others. While this decision is likely not the death knell for the toll road we would like, there will be a major uphill battle for them to overcome. We will be there at every step to trip them up and we will need your continuing support. If you haven't, please consider joining Surfrider Foundation and getting involved in your local chapter. Thank you for protecting the coast. This is awesome. I just read that they were going to build this toll road and I freaked. Then I read this post and am now at peace. Stoked! Good on ya! That was the best 14 hours of walking around with my hands over my head that I've ever spent.. I'm a bit bummed I didn't get a shirt.. I figured seeping into the background of the TV cameras was more needed than my getting a t-shirt..
What an awsome outcome.. 8 to 2!! Thanks to all who attended from those who couldn't attend !!! Just shows what can be done when everyone works together to promote a worthwhile cause. Let's keep up the fight to protect our beaches and coastal areas from development!